Technology is constantly changing the world, but some things never change. Cables on laptops, phones and tablets will ALWAYS fray. Replacing the charge on an expensive new laptop seems like an unfair additional cost, luckily it’s one that can easily be avoided. So long as the cores are not damaged or exposed and the cable still works, then Sugru can fix it! 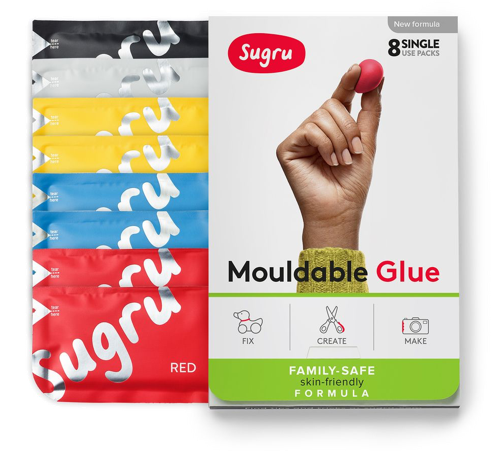 The Sugru is formula is perfect for this kind of DIY because it bonds brilliantly with cables and turns into flexible rubber once cured, so you can still move it around freely. CARE: Be careful with electricity. To ensure there’s no risk of electrocution, stick to low voltage items such as phone and laptop cables (maximum 24 Volts). To avoid heat build-up from short circuits or damaged wires, do not repair cables where the metal is exposed or the cable is already working intermittently. We don’t recommend it for DIY electrical work on items with higher voltage. Tear open your single-use packet of Sugru and knead it for approximately 30 seconds. Roll out the pack until you create a long, thin rectangle of Sugru that can comfortably wrap around the cable. Press the Sugru together and to the cable to ensure a good bond. Make sure it is firmly attached to the plastic casing of the power block and covers the cable for about the width of your hand, to provide a good strain relief. Hang the cable from a table or desk with tape, this is perfect for letting the Sugru cure and for giving the Sugru a great finish. To give Sugru a great smooth surface finish, gently and firmly rub the Sugru to get rid of all the fingerprints and cracks. Leave the Sugru to cure and in 24 hours it will be ready to go. Fixed, Flexible and Fun! Woohoo! To repair, upgrade and hack other gadgets check out our range of blogs for just that purpose here. If it’s your Apple products that are particularly in need, then check out this page.